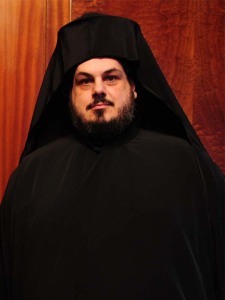 Metropolitan Konstantinos Tsilis was born in 1973 in Piraeus. He studied at the Higher Ecclesiastical Academy of Athens and the Department of Pastoral Theology of the School of Theology of Athens University. He has successfully completed seminars on a) journalism, b) elocution, c) the symbolism of the spoken and written word, d) filming and editing, in Greece and abroad, e) Dealing with those suffering psychological trauma following natural disasters, at the Eastern Mennonite University in the USA, on a US government bursary, f) traditional practical medicine, with an emphasis on first aid and malnourishment aid, in Thailand, g) teaching Greek as a second language, at the School of Philosophy of the University of Athens. As a layman, and for a period of fifteen years, he worked as a journalist for church and secular journals and newspapers, as a collaborator and producer of radio programs, and as a news editor for church and secular radio stations, including the stations of the Church of Piraeus, the Church of Greece, and the Radio Station of Art and the Word of the Municipality of Thessalonica. He is a regular contributor to the printed and electronic press. He served at the Holy Metropolis of Piraeus as a Sunday School teacher, on the staff of the summer camps, as a collaborator of the Youth Department, and as a representative at youth conferences. He was ordained Deacon by His Eminence Nikitas, Metropolitan of Hong Kong, on 25 January 2003, and Priest, by the same, on 26 January 2003. On 19 July 2003 he was elevated to the rank of Archimandrite. From 1998, he regularly visited the missionary Metropolitanate of Hong Kong as a volunteer, while after his ordination, in 2003, he served at the Holy Metropolitanate of Hong Kong and Southeast Asia as Vicar General, and from March 2005 until today, he served as Chancellor. Following the tsunami in South Eastern Asia, in December 2004, he organized programs of moral and material support for the victims of the disaster, the distribution of humanitarian aid, and the reconstruction of clinics and schools in Thailand and the Nias Islands off the coast of Sumatra, Indonesia. He has a good command of the written and spoken English language. He has some knowledge of Italian, French, and Hebrew. He also knows sign language and Braille. He was elected on November 3rd, 2011 by the Holy and Sacred Synod of the Ecumenical Patriarchate as the First Orthodox Metropolitan of Singapore and South Asia and he was ordained as Bishop on November 21st by His All-Holiness Ecumenical Patriarch Bartholomew.